Monday, May 7th saw the arrival of the May 2018 Sansar release, entitled the VR Chat release. As the name implies, this release includes the long-awaited option for those in VR mode to see text chat from those around them. Alongside of this is Twitch integration, a further avatar sit option, and other nips, tucks and updates. As always, full details are available in the release notes, this overview just highlights some of the key features / items in the release. In addition, a small update was issued on Tuesday, May 8th, 2018. As with the majority of Sansar deployments, this update requires the automatic download and installation of a client update. All existing terrain created using the Terrain Editor or through uploaded heightmaps should be replaced by the end of April. After this date, all terrain items that are still in scenes will be replaced by a place-holder asset. All terrain items in the Store that have been created using a terrain heightmap should also be removed from the Store as soon as possible. There is at this time no indication as to if / when the Terrain Editor will be re-introduced. A major limitation with Sansar up until now has been that those in VR mode have been unable to see text chat (either local chat or direct messages) in their headsets – which can lead to those using text as their preferred means of communications being ignored. 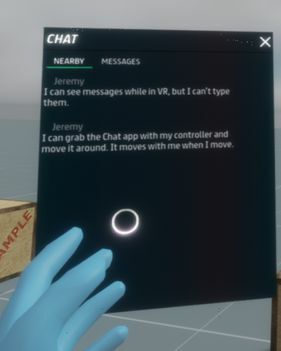 The Chat app in VR mode allows you to view messages from nearby people in your current experience in the Nearby tab and private messages in the Messages tab. It is not currently possible to send messages while in VR mode. You can move the Chat app by grabbing it with your Oculus Touch or Vive Wand and dragging it to a new location. When you move or turn your head, the Chat app moves with you. This update replaces the “move your head to select objects” approach with the more intuitive use of hand controllers. Simply point and hover over objects with the controller to select or pick up. Note that head movement is still required to use the Avatar tool when hovering over an avatar, however. This release brings with it the ability to create a Sansar account via Twitch, and then log-in to Sansar using your Twitch credentials. 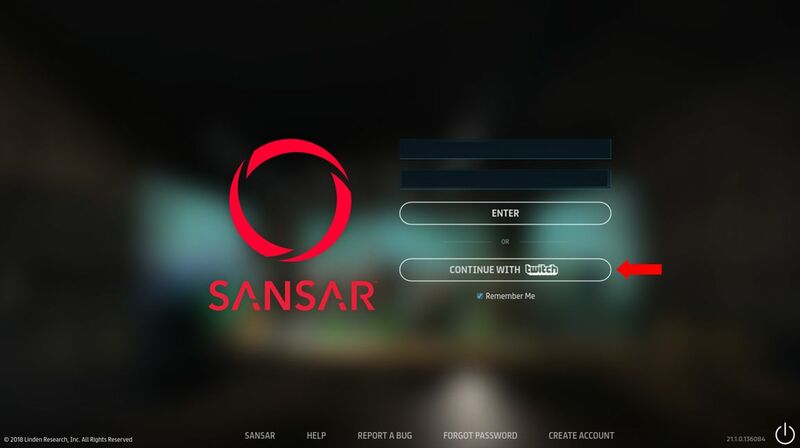 However, note that this is only for those creating a Sansar account via Twitch: it is not, at the time of writing, possible to link an existing Sansar account to a Twitch account and use the Twitch credentials to log-in to Sansar. See the Twitch Integration article from the Lab for more. 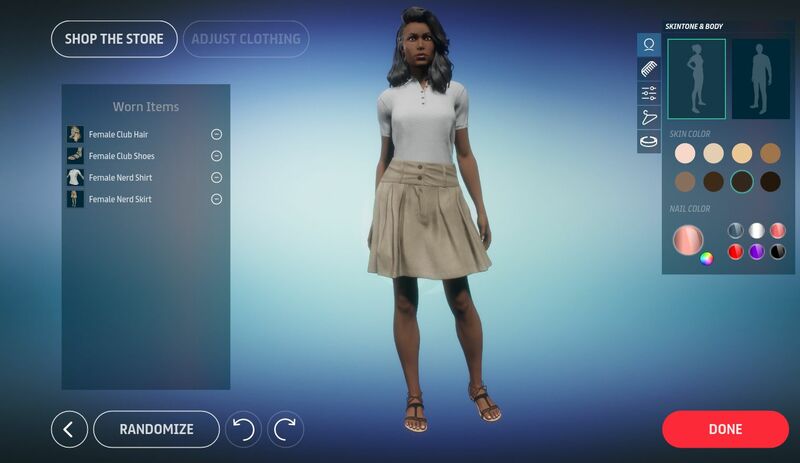 The Worn Clothing panel in LookBook > Customise option allows you to easily review, remove or adjust clothing on your avatar. The Sansar astronaut and highlands outfits have been added to the default clothing inventory. Adjustments for multiple Marvelous Designer clothing items can be made at the same time by clicking the “Adjust Clothing” button, or adjust each worn clothing individually by pressing on the “Play” button in the Worn clothing panel. A basic ground sit came to Sansar in the April release (see here for more). However, as I remarked at the time, for a female avatar wearing a dress, the sit pose wasn’t the most elegant. This has now been addressed, to a point, with a new “/sit 2” pose, which set an avatar kneeling – see the animation at the top of this article. The hands-through-the-skirt aspect is still a little distracting, but “/sit 2” is a big improvement, as well as adding a bit of variety to a group sitting on the ground together. API for object animation playback – play, pause, stop, rewind, slow down/speed up object animations via script. API to override the media URL in a scene – update the streaming media at runtime via script. Colours are now a supported type for script parameters. Visibility added on container properties for local position and rotation in the property editor. These are all explored in the Script API updates. The release notes also reference Avatar broadcasting the ability for one avatar to the precedence when speaking over others – useful for presentations, music events, etc. It’s not currently available for end-user use, but the Lab indicate it will be used in some Sansar events. An interesting update, but one that I have to admit, hardly excites. Frankly, I’m still of the opinion that if LL really want to encourage new users into Second Life, they really need to tackle the Sansar website – notably getting rid of ZenDesk (and Discord, which just doesn’t strike me as either scalable when it comes to supporting the hoped-for user base with Sansar, and which doesn’t have any real integration with Sansar) and establishing a properly integrated and informative web platform, with decently provided blog updates, a proper forum, etc., and which can help engage new users and make information a lot easier to see and to surface.